Deni Bonet is a New York City-based pop/rock singer/songwriter and classically trained violinist. She has recorded and performed with Cyndi Lauper, REM, Sarah McLachlan, Indigo Girls, and many others, as well as performing her own music around the world. Deni's new album, Bright Shiny Objects, has been receiving incredible reviews from some of the most prestigious music publications. Collective Brass performs classical music spanning the centuries! This engaging program delights audiences with classical favorites, beautiful melodies, and breathtaking energy. Beautiful, Bright and Fast features exciting music originally written for brass as well as virtuosic piano and vocal music written by Monteverdi, J.S. Bach and Debussy. ​Cellist, Erika Boras-Tesi and Pianist, Andrew Pak met gigging on the Elmwood Playhouse set in Nyack and subsequently formed the Piermont Chamber Music Society. They will be performing Beethoven’s cello and piano Sonata No. 1 and Rachmaninoff cello and piano Sonata Op 18. Both of these locals love to jam and share their passion for classic chamber works to music lovers in and around the Hudson Valley. The Candice Reyes Quintet (CRQ) brings a wide range of various styles, upbringings, experiences, cultures and more. We truly feel that this project represents each of us and establishes our approach musically. Candice Reyes born and raised in El Paso, Tx currently resides in New Jersey. The Candice Reyes Quintet (CRQ) formed in her hometown and followed her through her journey to the east coast. Reyes has jumped into the music scene and has been actively performing with her band. The CRQ will be debuting their first album called "Your Way" later this fall. 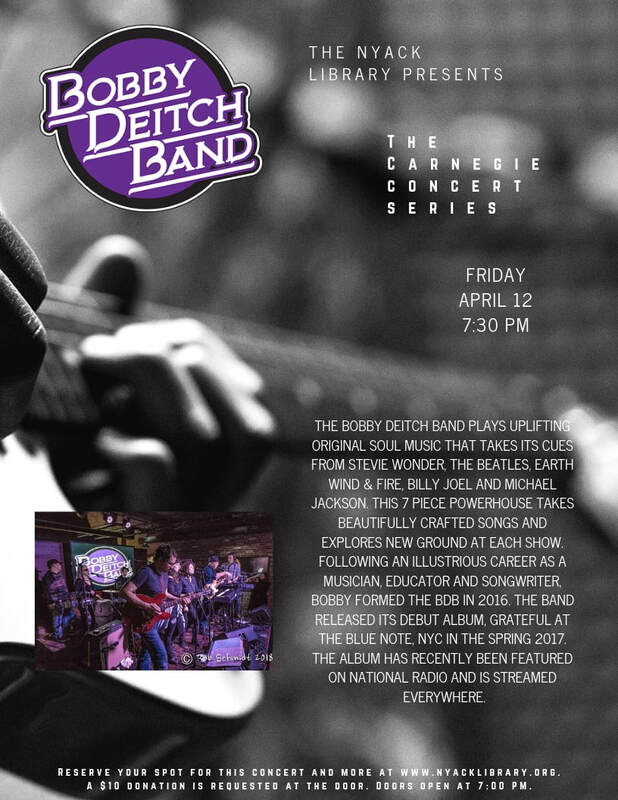 The album features six time grammy award winner and jazz renowned bassist Christian McBride, along with other featured guests. The young vocalist not only expresses herself through her vibrant voice, she interprets her natural character through song. The CRQ perform actively in the Trio-State area, Texas, New Mexico, Mexico and more. Her experience as a vocalist and bandleader have expanded her career in the music scene. Besides leading her band she works for a non-profit organization Jazz House Kids based in Montclair, NJ where she is the Artist Relations and Concert Coordinator. Through this experience Reyes brings a broad range of musical and professional experience to the table. Reyes and husband Abel Mireles also began and founded their organization called The Jazz Exchange. This organization builds communities through jazz music. Not only is her musical career building a name for Reyes, but she has been pro active in the community to continue this musical form we love and call jazz. ​Celebrating it’s 25th season as an ensemble, Sing We Enchanted will be performing long-standing favorite carols from olden times to the present day. Joyous melodic hymns, tranquil lullabies, and festive carols hail from Italy, Poland, France, Spain, Germany, England and other locales in Europe, as well as carols from North and South America. Revered carols: In the Bleak Mid-winter,” “Mary, Did You Know,” and the beautiful “In Dulci Jubilo” and a Macdonald Shape-note arrangement will also be among the selections. ​Yong Tae Kim has been a member of the Seoul National Symphony in Korea, the Calgary Symphony and the Edmonton Symphony in Canada and was the concertmaster and soloist with the Inland Empire Symphony in California. He has played with the New Jersey Symphony Orchestra, was the principal second violin and soloist with the Wayne Chamber Orchestra and a member of the Lake George Opera Festival Orchestra. He has been a member of the orchestra for many Broadway shows, including The Secret Garden and the Lion King. Mr. Kim has performed in solo recitals and chamber concerts in Europe, South America and in his native country, South Korea. He is a frequent performer in the New York area, most recently at Columbia University, the Donnell Library and in yearly recitals at the New Jersey City University. An experienced and dedicated teacher, he has been on the faculty of the Mount Royal College School of Music in Calgary, Canada, the Claremont Community Music School in California, the Waldorf School in Garden City, NY, the Thurnauer School of Music in New Jersey and the Summer String Festival at the Elisabeth Morrow School. He is currently on the string faculty of the New Jersey City University where he teaches violin and chamber music and is the founding member of the Zanoli String Trio which is in residence at NJCU. He has twice presented masterclasses for the New Jersey String Teacher’s Association Annual Symposium. Mr. Kim received his bachelor of music degree from the Seoul National University and did graduate studies at Indiana University where he studied with Yuval Yaron. 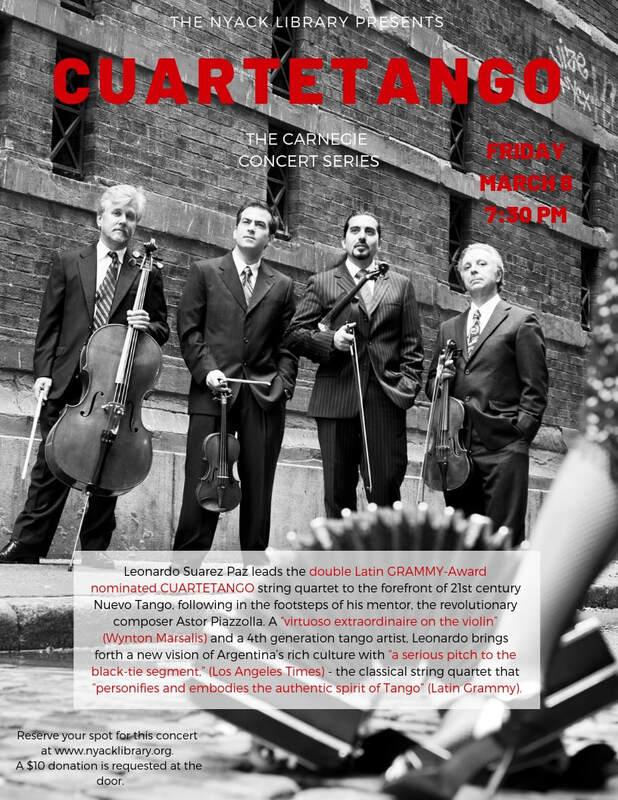 Leonardo Suarez Paz leads the double Latin GRAMMY-Award nominated CUARTETANGO string quartet to the forefront of 21st century Nuevo Tango, following in the footsteps of his mentor, the revolutionary composer Astor Piazzolla. A “virtuoso extraordinaire on the violin” (Wynton Marsalis) and a 4th generation tango artist, Leonardo brings forth a new vision of Argentina’s rich culture with “a serious pitch to the black-tie segment,” (Los Angeles Times) - the classical string quartet that “personifies and embodies the authentic spirit of Tango” (Latin Grammy). Cuartetango released its first album L'Atelier on EMI Classics and has been featured in the Sala Grande of the Teatro Colon Opera House and Teatro Alvear in Buenos Aires, the Lincoln Center for the Performing Arts and The Metropolitan Museum in New York, Chautauqua Institution, Cleveland Museum of Art, Buenos Aires Tango Festival, in a PBS WHYY special, Emmy-winning TV special "Rhythm & Roots," on WQXR, National Radio in Argentina and live at the 13th Latin Grammy Awards Ceremony. This special program with bandoneon will features compositions from Cuartetango's album Masters of Bandoneon, which received a double Latin GRAMMY-Award nomination as Best Tango Album and Best Classical Contemporary Composition. Their new album is set to be released early 2019. South African-born Toby Tobias shares his story of hope during a time of war and upheaval across three continents, from Johannesburg to Jerusalem... then here. Toby shares the vivid tale of his life in South Africa under the rule of an apartheid government, then in an Israel on the brink of battle for it's own identity, before finding a home, and many stark parallels, in the United States of America. 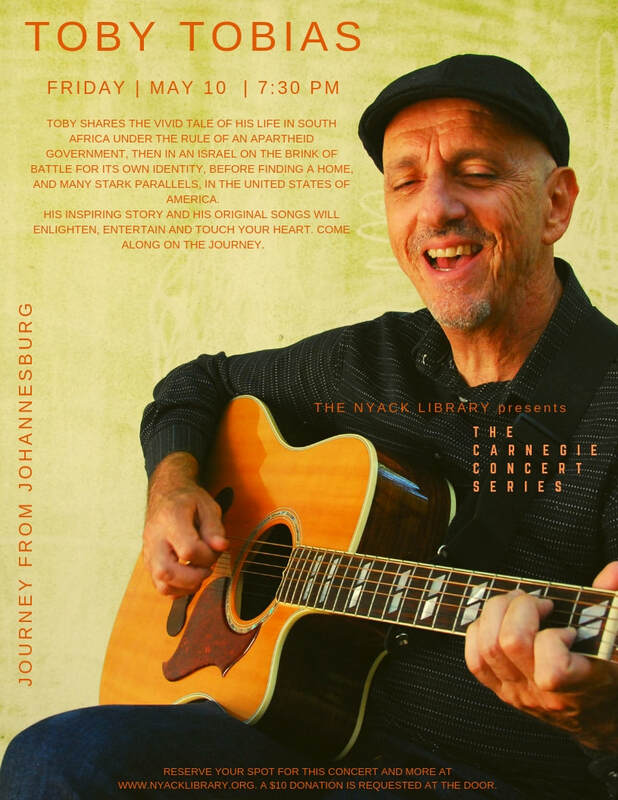 Journey From Johannesburg performs at theaters, colleges, conferences, festivals, libraries, middle and high schools, and religious and community centers. His inspiring story and his original songs will enlighten, entertain and touch your heart. Come along on the Journey.